This entry was posted on Sunday, January 6th, 2019 at 7:21 pm	and is filed under Uncategorized. You can follow any responses to this entry through the RSS 2.0 feed. You can leave a response, or trackback from your own site. At first glance I thought this was a church–till I saw the view. Very interesting play of light! This is such a dramatic photo! Love the juxtaposition of darkness and light, especially on the floor. Well done. Curious to know where this was shot. The reflection on the floor from the side window is lovely, as are the light-filled window that punctuate the blackness. It’s only when you look closely at the outside views that you realize this is not a great neighborhood. 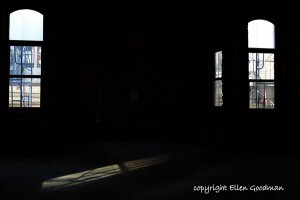 This photo was taken inside an old building that is being restored. It’s actually on the upper east side, in a lovely neighborhood. What you see out the window are the remains of an old playground. I love the way you’ve captured how the light falling through the window creates such interesting positive and negative shapes across the ground plane! Awesome and captivating photo, Ellen! My favorite is the light thrown onto the floor. Well done!